Burger recipe The more delicious it is to taste, it's your own eating. If you have not eaten it yet, you must eat it once. Burgers available in every corners of city because it is famous all around the world.Burgers are made with veggies and also with non veg. Today we learn that how to make Veg Burgers.Veg burgers prepared with tikki, cucumbers, tomatoes, cottage cheese and sauces and cream layers in buns look very pleasant. 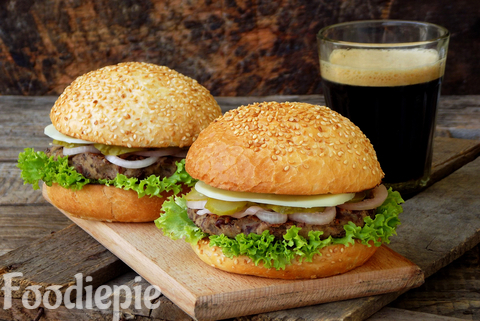 These burgers included in street food are very dear to children We can not tell it as much as it sounds in taste.So without wasting any time let's checkout recipe first. Step 1 : Peel the all potatoes and grate it. Mash the peas well and put them in the potatoes. add ginger paste, green chillies, salt, amchoor powder, cumin powder, coriander powder and half of the bread crumbs and mix all the ingredients well. Step 2 : Now take the little mixture of potatoes and make small balls after that flatten ball with the palm.Prepare it by wrapping it in a crumbled bread and lowering it from the palm and giving it the shape of the tikki and prepare the second tikki in the same way. Step 3 : Heat 2 tablespoon oil in pan and fry Both sides of prepared Tikkies for 5 minutes or until it turns golden brown color. Step 4 :Cut vegetables into slices.Wash the cucumber and peel it and cut into a thin round slice. Wash the tomatoes thoroughly and clean them and cut them into thin round slices. Step 5 : Now Cut bread Buns from the middle and divide it into two parts. Put a little oil or butter in the pan and shallow fry bun halves until light brown. Step 6 :Take bottom base of bun and spread Tomato ketchup over it then the place cucumber slices and stir the chaat masala on them. Now put the Tikki on it and keep 1 leaf of the cabbage on top, keep the cheese slice over it. Put a little bit masala on it again and again keep the cabbage leaf and tomato pieces and little chaat masala on top of it. Take the second Bun of Bread and put green coriander sauce on it, put it on top of cream. Finally : Creamy Delicious Veg Burger is ready, prepare the second burger in the same way. Serve with the sauce and cold drinks if you want.